By-name rules can be used in the Domain pane, in zones of the Zone pane, in zones applied to applications in the Programs pane and the Zone for All the Applications of the Settings pane. 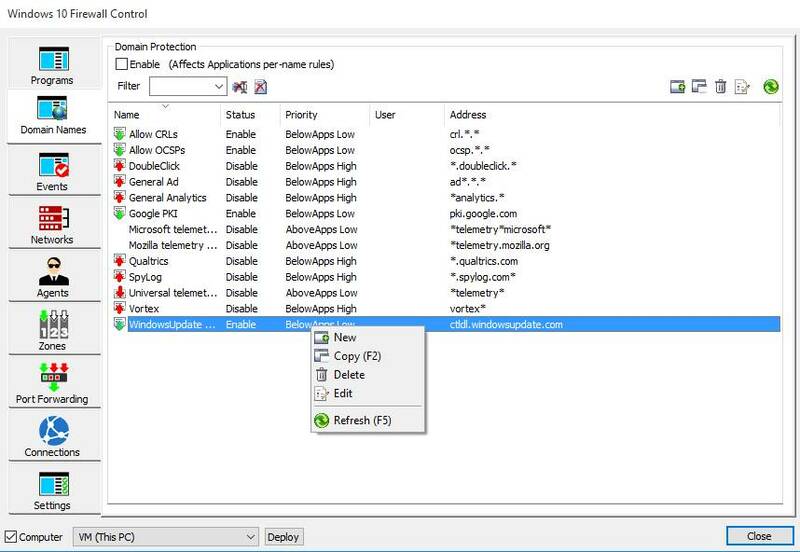 Windows 10 Firewall Control can create filtering rules using domain (web site) strict names and name patterns. "*", "?" and "[a-x]" (character intervals) are allowed for the patterns creation. Example the "*telemetry*" pattern matches all the domains that include the "telemetry" word inside, e.g. "telemetry.microsoft.com", "telemetry.mozilla.org". The patterns are analyzed using "." (dot) strictly, so "*.a-name.com" is not equal to "*a-name.com" The first matches a-name"s sub domains, e.g. "something.a-name.com" and "somethingelse.a-name.com" only, but not "anythinga-site.com". Patterns without a template sign (i.e. "*", "?") match the name itself and all the sub domains simultaneously, e.g. "a-site.com" as a pattern matches "a-site.com" itself and "anything.a-site.com" as well. The filtering is made by strict domain/site names, not by URLs/links. No folders/protocols can be used for composing by-name rules. So "http://a-site.com" and "a-site.com/something" are syntactically incorrect and match nothing. Windows 10 Firewall Controls protects applications by IP addresses (IPv4 and IPv6) finally anyway. 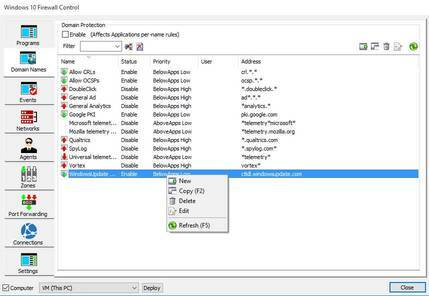 Windows 10 Firewall Control just traces all the domain names changes and creates corresponding by-IP filters immediately in runtime. The tracing is precise and exhaustive, so multiple IP addresses for domains and IP addresses mutability are supported in full for the both IPv4 and IPv6 communications. As the final protection is made on by-IP basis anyway, you should take into account that a single IP may match several domain names at once. For instance "www.a-site.com" and "a-site.com" may have the same single IP address or the same set of IP addresses, so please be aware of the possible clashing while creating mutually exclusive permissions for such domains. All the rules arbitration follows the rules precedence below.